Junior Chamber International (JCI) held their annual netball competition on Saturday 14th June. Nine Manchester businesses entered their teams to fight it out on the court to see who would reign supreme. Team Bond went home the winners after beating Pannone 10-9 in a close final tie. The teams were all in great spirits, and the raffle on the day raised £350 for Forever Manchester. JCI are members of our Manchester Millions club and help to raise money for us at various events they host. The next event is their World Cup Quiz on Wednesday 18th June at Manchester’s 235 casino. 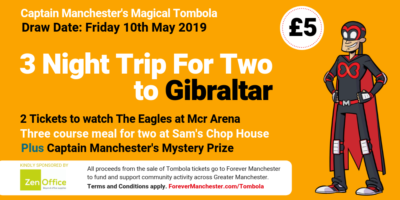 Tickets are £15 for members and £20 for non-members, with a donation coming directly to Forever Manchester from every ticket sold. The price includes two drinks vouchers and a half-time snack of curry and rice during the airing of the Spain v Chile game. To purchase a ticket to this event CLICK HERE. If you’re interested in becoming a Manchester Millions member, contact Jean Mills, Head of Business Development via telephone on 0161 214 0940 or email jean@forevermanchester.com.